Livorno — Livorno P.Za Della Repubblica Arr. 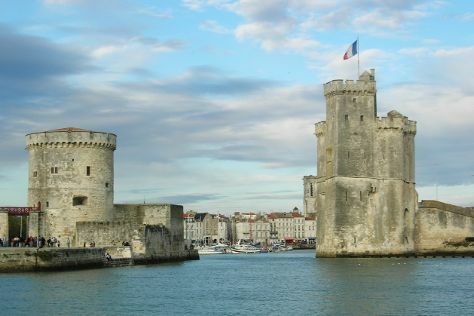 Start off your visit on the 17th (Wed): pause for some serene contemplation at Eglise Saint-Martin d'Esnandes, make a trip to Towers of La Rochelle, and then explore the activities along Vieux Port. To see traveler tips, maps, and other tourist information, you can read our La Rochelle trip planner . Limoges to La Rochelle is an approximately 3-hour car ride. You can also take a train; or take a bus. Expect a daytime high around 19°C in April, and nighttime lows around 9°C. Wrap up your sightseeing on the 17th (Wed) to allow time to drive to Perros-Guirec. Start off your visit on the 18th (Thu): look for all kinds of wild species at Sentier de L'ile Renote, then identify plant and animal life at Reserve Naturelle des Sept Iles, then enjoy the sights with a stroll at Sentier des douaniers, and finally appreciate the extensive heritage of Grand Site Naturel de Ploumanac'h. To see photos, traveler tips, and other tourist information, read our Perros-Guirec holiday maker app . Drive from La Rochelle to Perros-Guirec in 5 hours. Alternatively, you can take a bus; or take a train. While traveling from La Rochelle, expect little chillier days and about the same nights in Perros-Guirec, ranging from highs of 15°C to lows of 7°C. Wrap up your sightseeing on the 18th (Thu) to allow time to drive to Bayeux. Start off your visit on the 19th (Fri): admire the landmark architecture of Cathedrale Notre-Dame, then take in the history at Memorial 1st US Infantry Division Omaha Beach, then witness the site of a historic battle at Omaha Beach, and finally contemplate the long history of Pointe du Hoc. On the 20th (Sat), you'll have a packed day of sightseeing: pause for some serene contemplation at Abbaye Saint-Martin de Mondaye, then stroll the grounds of Bayeux War Cemetery, then witness the site of a historic battle at Musee du Debarquement Utah Beach, and finally examine the collection at Airborne Museum. For where to stay, traveler tips, maps, and other tourist information, refer to the Bayeux trip itinerary maker website . Traveling by car from Perros-Guirec to Bayeux takes 3.5 hours. Alternatively, you can do a combination of bus and train; or take a train. In April, daily temperatures in Bayeux can reach 17°C, while at night they dip to 5°C. Cap off your sightseeing on the 20th (Sat) early enough to go by car to Amiens. Lovers of literature will adore Amiens as the hometown of author Jules Verne, along with the Somme canal linked to the Canal du Nord that runs through the town to the English Channel. On the 21st (Sun), look for all kinds of wild species at Les Hortillonnages d'Amiens, then stroll the grounds of Peronne Road Cemetery, then stroll the grounds of Bernafay Wood British Cemetery, and finally stroll the grounds of Gordon Dump Cemetery. Get ready for a full day of sightseeing on the 22nd (Mon): explore the different monuments and memorials at Serre Road Cemetery No.2, then steep yourself in history at Beaumont-Hamel Newfoundland Memorial, then stroll the grounds of Ancre British Cemetery, and finally take in the spiritual surroundings of Cathedrale Notre-Dame d'Amiens. To find other places to visit, maps, photos, and tourist information, read Amiens trip planner . Traveling by car from Bayeux to Amiens takes 3 hours. Alternatively, you can take a train; or take a bus. In April, daily temperatures in Amiens can reach 18°C, while at night they dip to 6°C. Finish up your sightseeing early on the 22nd (Mon) so you can travel to Calvi. Calvi is a commune in the Haute-Corse department of France on the island of Corsica.It is the seat of the Canton of Calvi, which contains Calvi and one other commune, Lumio. On the 23rd (Tue), steep yourself in history at Citadelle de Calvi, look for all kinds of wild species at Wildlife Areas, and then get outside with Wild Machja. To see other places to visit, maps, ratings, and other tourist information, read our Calvi trip itinerary maker site . You can do a combination of train and flight from Amiens to Calvi in 5 hours. Other options are to do a combination of train, flight, and bus; or do a combination of car and ferry. Traveling from Amiens in April, expect Calvi to be a bit warmer, temps between 22°C and 11°C. Wrap up your sightseeing on the 23rd (Tue) early enough to travel to Saintes-Maries-de-la-Mer. Engulfed in the Provençal culture, Saintes-Maries-de-la-Mer has many literary, artistic, and musical references from master artists due to its location where the Rhône meets the Mediterranean and as the pilgrimage destination for Romany people, sometimes called gypsies. Start off your visit on the 24th (Wed): trot along with a tour on horseback, then admire the striking features of Tours et Remparts d'Aigues-Mortes, and then identify plant and animal life at Le Parc Ornithologique de Pont de Gau. To find reviews, photos, traveler tips, and tourist information, go to the Saintes-Maries-de-la-Mer route planning tool . You can do a combination of car and ferry from Calvi to Saintes-Maries-de-la-Mer in 11 hours. Alternatively, you can do a combination of bus and ferry. Expect a daytime high around 21°C in April, and nighttime lows around 11°C. Wrap up your sightseeing on the 24th (Wed) early enough to drive back home.